You Are Here: Home > Galveston Daily News Columns > Farewell to our Readers! In May of 2013 three former primary election candidates who were running for the Congressional seat being vacated by Ron Paul began writing weekly columns for the Galveston County Daily News. The reason for the paper’s interest was that opposing candidates just don’t become friends; but the three of us did and over the years those friendships have grown stronger. It was John who mentioned that we were “Three Musketeers” in our very first column and the name stuck! All of us have taken a turn as the primary drafter of these columns with the rest of us making suggestions; sometimes on substance and other times grammatical. Although we didn’t always agree on every point in the columns, we generally agreed on most of the salient points. Over the years we have enjoyed the opportunity to share our views. We have enjoyed, and at times smiled at, some of the letters to the editor generated by what we had written. The threads of the online comments were often interesting with some completely missing the points we were making and going off on a tangent while most were on point – although not necessarily in agreement with us! One of the most ardent and articulate commentators was Carlos Ponce. We point him out because almost every time he jumped into the discussion he not only made comments that were right on target but also because he invariably included links to references backing up his positions. We’ve never met him but we applaud his willingness, and the willingness of others, to contribute to the ongoing dialogue. As we said in our first column, we were just three of the nine candidates that chose to set aside the time and effort to continue to make an impact on our local community (as we are sure some of the other candidates have done as well) and to give back to that community. Why? Because it was never about us. It was about our nation, our children and our children’s children. Simply put we cared enough to use what some called our own “special” knowledge, skills and abilities to make a difference. Mark brought to the table, not only a keen ability to research topics, but also a special love for, and knowledge of, U.S. history. Bill (or Sarge) had an extensive and invaluable background in Washington on Capitol Hill and in Austin as well with a hands-on understanding of their workings. And, John brought his experience as a small business owner, his quick wit as an auctioneer and his problem solving skills. And so it is, after writing over 225 columns over four plus years, this will be our last column. 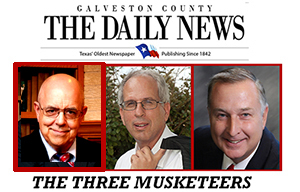 We thank the Galveston County Daily News for the opportunity to share our thoughts and for our readers who kept looking forward to next Monday’s issue to see what subject “The Three Musketeers” might bring up next. Our blessings to you all and thanks from the bottom of our hearts.